Receive all the benefits of pure, odorless Garlic, which contains antioxidants to support the cardiovascular and immune systems. Andrew Lessman's DEODORIZED GARLIC EXTRACT is the most recent evolution of our mild, deodorized extract of Garlic. This formula concentrates all the natural goodness of fresh Garlic without the unpleasant aftertaste, stomach upset or odor. It provides highly standardized levels of Garlic's most important active sulfur-based compounds: Allicin, Alliin, Thiosulfinates and Gamma-glutamylcysteinates. Garlic's most beneficial compounds are also its most potentially irritating and unpleasant; however, unlike typical Garlic products, we preserve the full activity of Garlic while also ensuring a mild and gentle formula. Garlic has been a popular spice and traditional remedy for over 5,000 years and today, its health benefits have been confirmed by extensive clinical study. Garlic contains potent anti-oxidants and protective compounds while also possessing a well-established role in promoting heart and cardiovascular health. Despite the extensive benefits of regular Garlic consumption, most Americans avoid its frequent use due to embarrassing odor and unpleasant digestive effects. 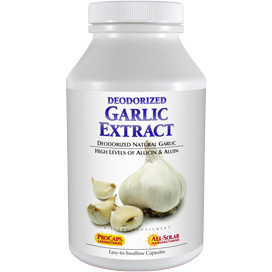 Our Deodorized Garlic Extract delivers all the goodness of Garlic without its unpleasant odor or digestive issues. 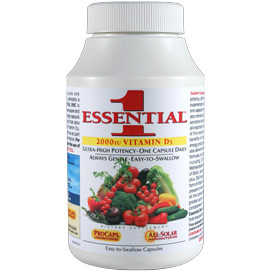 SUGGESTED USE Consume one or more capsules daily with food or as recommended by a health care professional. Because of the potent, active compounds this natural garlic formula contains, it is always best taken with a complete meal. 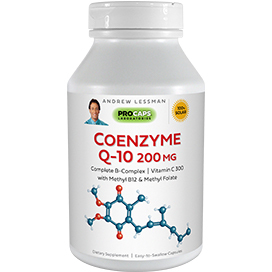 This product is most effective as part of a healthy diet and active lifestyle, along with one of ANDREW LESSMAN'S multi-vitamin-mineral formulas. I know the benefits of garlic, plus I enjoy adding to my food. 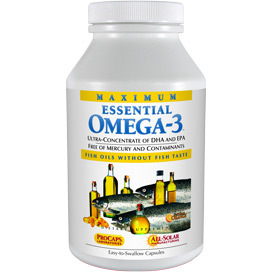 With your product, never swallowed a capsule, but sprinkle the capsule on pasta, rice,potatoes, and it is delicious. Just a nice small taste of garlic. Highly recommend. Thank you. First time in my life I have ever been able to ingest Garlic without stomach upset. 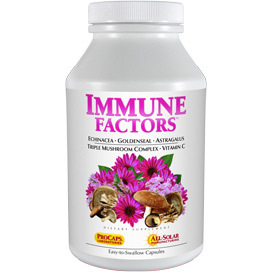 This product has allowed me for the very first time to take Garlic, without smelling like Garlic myself, as not ONE person has said they smell it on me, I take 3 pure Garlic powder pills a day, and that works for me. I have noticed my colds this winter are MUCH shorter, or I do not get one at all when everyone around me is getting one. Probably because I take this, plus the Founders Vitamins, and that is the ticket! Thanks, Andrew and the whole team behind the scenes. Give them a raise!!! Unlike other Garlic I have taken, this Garlic has NEVER given me an after taste at any time, - doesn't matter if I take it with a meal, after a meal or even alone. I usually take it with other capsules, sometimes even three at a time, and actually forget that I am taking them as I have no side effects at all. I've been taking Andrews' garlic capsules for years, I take one every morning with the rest of my vitamins and have never had any stomach issues with them and they are odorless. If I ever feel a cold coming on, I'll pump up the dose and also add them to my vitamins in the evening...I haven't had a full-blown congested cold since! As far as I'm concerned...I wouldn't be without them!!! I take this everyday with no garlic odor or taste. 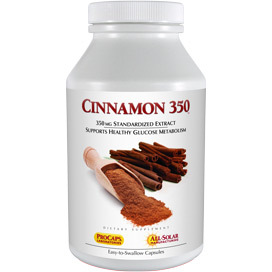 I recommend taking this after you have consumed a small portion of your meal and then finish the remainder of your meal. If taken at the end of a meal it can, at least for me, cause heartburn and stomach gas that will clear a room, lol. Other than that, no one would know you are consuming garlic. 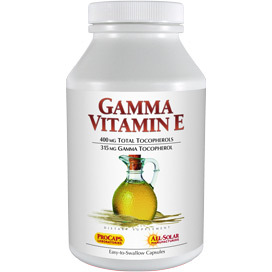 This product is great! Anytime we feel a sniffle or any kind of illness trying to start, we pop one of the garlics in and by the next day we feel fine. We always keep this on hand. Works great for us.